Who must apply for this real estate practice coverage? Any LAWYER who intends to practise REAL ESTATE LAW in Ontario must be ELIGBLE for, apply for, and be granted this additional coverage before being able to practise. For more on this, see the definition of REAL ESTATE LAW in Endorsement No. 2 of the POLICY. Title insurance provides coverage for fraud, and most transactions are now title-insured, so why do we need this new coverage? Why do LAWYERS have to pay this additional premium? Fraud takes many forms, and may take place regardless of the type of transaction or whether any or all of the parties acquiring an interest in the land happen to be title insured.With the requirement that all ELIGIBLE LAWYERS who intend to practice REAL ESTATE LAW in Ontario purchase this coverage, the public and Land Titles Assurance Fund are assured of protection against the effecting of registration of fraudulent instruments under the Land Titles Act where there is no title insurance to respond. Transactions that are entirely fraudulent in nature, with no opinion or title insurance having been provided. It affords protection even in the instance of SOLE PRACTITIONERS, who may not carry any amount of innocent party protection. If only one LAWYER in our LAW FIRM assumes responsibility for registering all transfers handled by our firm, do I and the others also have to have this real estate practice coverage in place to practice REAL ESTATE LAW? Yes – all LAWYERS who practise REAL ESTATE LAW must apply for this coverage. I am not sure whether I am obliged to apply for the Real Estate Practice Coverage. Which types of activities would obligate me to apply for this coverage? LAWPRO has developed a self-assessment tool to assist you in determining whether or not you must apply. Will the cost of the Real Estate Practice Coverage be discounted for part-time practitioners – i.e. will there be an equivalent 50 per cent premium discount? No. Statistics indicate that the risk of fraud in real estate practice is not proportional to the volume of work processed. A LAWYER who practises on a part-time basis – or who does only very little real estate work as part of their overall practice – is as likely to have a CLAIM with a fraud component as one who specializes in real estate full-time. What if I decide to change practice at some point during the year and stop practising any REAL ESTATE LAW? Only one premium adjustment per LAWYER for this option for the year (beyond this, the full $100 annual premium would apply). 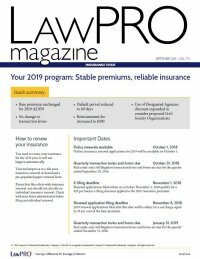 If you decide not to continue to carry this coverage, you should provide LAWPRO with a completed Application for Mid-Term Changes – Real Estate Pratice form within 30 days for any available reduction in premium to be applied. If I intend only to practise REAL ESTATE LAW later in the year, do I need to apply for it now and pay for the whole of the year? If you commence the practice of REAL ESTATE LAW part way through the year provide LAWPRO with a completed Application for Mid-Term Changes – Real Estate Pratice form at least 10 days prior to the date that the requested change is to take effect. I’ve just been notified that I am no longer ELIGIBLE for the Real Estate Practice Coverage Option. Why have I been advised of this? and those under investigation, where the Law Society obtains an interlocutory suspension order or a restriction on the LAWYER’s practice prohibiting the LAWYER from practising real estate or an undertaking not to practise real estate. Contact the Monitoring and Enforcement department at the Law Society of Ontario directly with respect to further details regarding your eligibility/ineligibility to practise REAL ESTATE LAW. Please note that you are not permitted to practise REAL ESTATE LAW in Ontario for any period during which you do not meet the eligibility criteria according to Law Society records, even though the Real Estate Practice Coverage Option may continue in force for a period of time. I need to do a registration through Teranet®. They have advised me that I require Real Estate PracticeCoverage through LAWPRO in order to access the system. Is this correct? Every Ontario LAWYER who practises REAL ESTATE LAW is required to carry the Real Estate Practice Coverage Option. To access Teranet, a LAWYER must maintain this coverage as an option under the primary LSO program POLICY. I left practice three months ago, but didn’t let LAWPRO know. Can I get a refund for the Real Estate Practice Coverage dating back three months? As LAWPRO may have provided Teranet with assurances that you had maintained the Real Estate Practice Coverage option in the intervening period, we are regretfully unable to backdate your application for exemption or provide a refund for this period. Your professional liability insurance coverage status will be amended effective the date of our receipt of your completed Application for Exemption form and a refund, if applicable, will be provided as of that date. How does the Real Estate Practice Coverage differ from Innocent Party Coverage? No protection is provided under this Real Estate Practice Coverage for registrations occurring prior to the new coverage coming into force, nor for CLAIMS to which title insurance would apply. Does my purchase of the Real Estate Practice Coverage affect my obligation to buy Innocent Party Coverage? No. While the endorsement providing for the Real Estate Practice Coverage Option is a modified form of Innocent Party Coverage, it is not a substitute for the coverage (described more fully in Endorsement No. 5 of the POLICY) that must be purchased if you are practising in an association, partnership or LAW CORPORATION (with more than one LAWYER). I wish to add the Real Estate Practice Coverage Option to my insurance coverage and I require it ASAP. If I submit the appropriate executed form today, will the coverage be added immediately? Due to the nature of this coverage, it is important that LAWPRO conduct its due diligence before adding it. Therefore, it may take up to 10 business days to add the Real Estate Practice Coverage Option to your POLICY coverage. It may be necessary to engage the services of another Real Estate LAWYER to handle your real estate transactions in the interim.